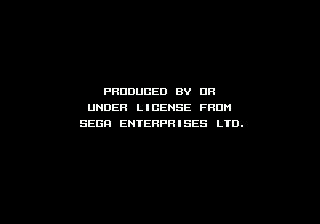 The TradeMark Security System (TMSS) was developed in order to prevent piracy, as it only allows games with the word "SEGA" in a certain part of the game's code to boot up. This did not prevent unlicensed games from being released on the Genesis, however. This logo, including its palette entry, is loaded into the pattern table but is never shown at any point during the screen for some reason. It would have likely been used for the "SEGA" part of the disclaimer. This page was last modified on 16 February 2016, at 23:29.